The Bowflex SelectTech 560 Dumbbells are the world's first-ever smart dumbbells, offering a fully interactive experience to work out harder and smarter. 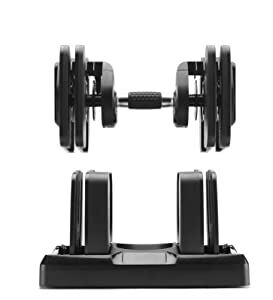 Equipped with the company's proprietary 3DT sensor, the Bowflex SelectTech 560 Dumbbells are the only home strength product with built-in brains to guide users through exercises while tracking reps, sets, calories burned, and providing feedback on form. 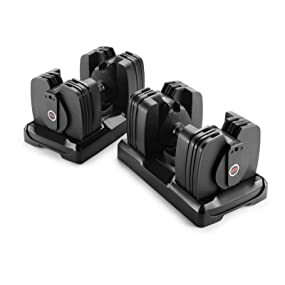 The Bowflex SelectTech 560 Dumbbells' compact design reduces the number of separate dumbbells from 32 down to only two - making them the perfect addition to any home gym. Changing the weights is as easy as twisting the handle. Users can track workouts and set goals using a free 3DT app for their smartphone. Once the app has been downloaded, users can sync the app with Apple Health, Google Fit, MyFitnessPal and UA Record. The 3DT app also comes with 70 preloaded step-by-step workout videos. - More compact than the current 552 Dumbbells. - Just twist the handle to select your weight, no more turning two dials. - Durable molding around metal plates provides a smooth lift and quieter workouts. - Each dumbbell adjusts from 5lbs to 60lbs. 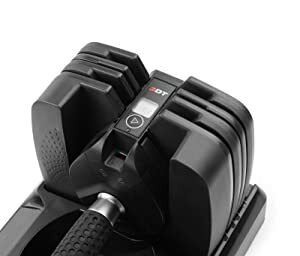 - Bluetooth connectivity combines with the Bowflex 3DT (Three Dimensional Trainer) to count reps, weight lifted, reps, calories, and more. - LCD window show weight selected, Bluetooth connection, battery life and sound selection. - Bowflex Connect app brings it all together by compiling your workout weight, calories and time. - Choose a pre-loaded workout like Armageddon, Crazy Core, Legs of Steel, Back Attack, and more. - The 6 Week Challenge will get you started quickly. - Videos of over 70 workouts will ensure you use proper form. It's strength training reimagined, combining the best features of the #1 selling selectorized dumbbell in the world with cutting edge performance technology. Integrated Bluetooth tracking combines with the 3DT app to track weight, count reps, and sets and provide advanced video coaching to ensure perfect form every time.